The bushbuck is medium-sized antelope, which is stockily built with a short neck and legs. Sub-adult rams are a deep chestnut brown that darkens with age, with a few white spots on the flanks and a crest of yellowish hair running down the back. There is a white patch high on the throat and a white band at the base of the neck. The long hair of the bushbuck gives the coat a furry appearance. The tail is short, furry and white beneath and is lifted during flight to show flashes of white from behind. Only males have horns. Males are slightly larger than females. Females are paler than males and have two pair of mammae between their hind legs. Bushbuck are very selective browsers, eating leaves and shoots, buds, flowers, mushrooms, fruits and succulent roots dug out with the front feet. They will take dry fallen leaves in the winter and often feed at forest edges. Bushbuck are predominantly nocturnal. Activity starts two hours before sunset and continues until an hour after sunrise. During the daylight hours they tend to remain under the cover of thicket. Bushbuck sometimes appear in open sunny spots in both mornings and afternoons. 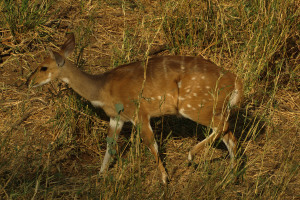 Due to their preferred thicket habitat, bushbuck seldom flee further than 40 – 70 yards when alarmed. They freeze in their tracks until the danger is 5 – 15 yards away and then dart off at great speed to dive into the nearest thicket. Individuals from the same group do not follow each other but make for their own cover. Bushbuck are crawlers by nature but can clear a 1.6 metre fence when pressured. Social groups of bushbuck are usually intolerant of each other’s presence, especially if the veldt condition and fodder quality is good. During a drought they become more tolerant and at times like these up to 30 individuals may be found feeding together. Rams become extremely aggressive when wounded and will wait for the pursuer in thick cover and charge at the last moment, attacking with the head held low and the horns pointed forward. 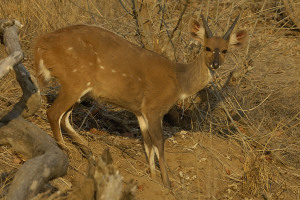 Bushbuck can be hunted by walk-and-stalk but the hunter must be well camouflaged, walk quietly and slowly with frequent stops in shadow or cover. Be sure to monitor wind direction at all times as bushbuck have an excellent sense of smell and the slightest whiff of human sent will send them running. They also have good vision. Bushbuck are vigilant and if disturbed they will run into thick cover. They are water dependant and may occasionally visit a waterhole, affording the hunter a shot from a blind, platform or treestand. The type of habitat they frequent sometimes provides a thick mat of old leaves to walk on. If they are damp or wet it makes for quiet stalking. The best time to get bushbuck out and about is late afternoon or early morning. 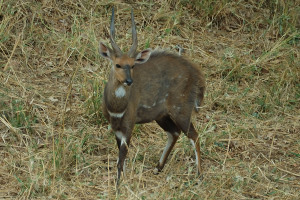 Although bushbuck are not large antelope, they are tough and very tenacious and can be very dangerous when wounded. Try for a side-on or quartering-away shot into the heart/lung area. This shot is very likely to present itself at short range owing to the nature of the habitat they frequent, so be careful to draw the bow when the animal’s attention is diverted away from you. Wait at least 30 minutes before following up on a good heart/lung shot. 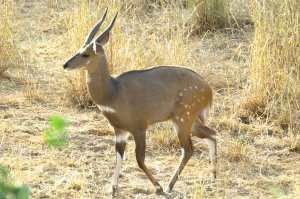 Bushbuck have a reputation for being mean and it is well documented that many hunters have been injured and some even killed by bushbuck. Taking a handgun or shotgun along on the follow-up is a good idea. Wait 3 hours for a suspected liver shot and at least 8 hours for a gut shot. It is quite likely that bushbuck will run into heavy cover as soon as it has been hit by an arrow and will be lost from sight. Listen carefully for once it is out of sight as the sound of breaking through the vegetation might provide an idea of its direction of flight during the follow-up.